You probably can't turn a corner in the office without hearing about Voice over IP--a popular, cheap, and effective way to provide telephony to businesses. The premise is simple: Instead of using the existing telephone lines in your building, or having new ones installed, you push all of your voice, teleconferencing, and video traffic through the Internet. The single most expensive component of a phone bill is the minutes. But VoIP differs from regular telephone service by treating your phone conversations as data passing through your IP network. In today's world, broadband is relatively cheap and easy to get, so VoIP has considerable appeal to businesses that want to cut costs and use their existing resources more efficiently. VoIP can reduce your business costs in several ways. First, it frees your business from ever having to to install new phone lines. VoIP services such as Vonage provide equipment that hooks directly into your existing broadband network, and those services' rates are extremely competitive with typical business phone plans. You can even arrange for the service to install the necessary hardware in your telecommuting employees' homes. Second, VoIP can operate through an encrypted VPN connection for increased security. You can install VoIP software on mobile devices too, so that your employees are always connected and reachable from a "work" line, even when they're physically away from the office. The usual business-phone features are available on VoIP: voicemail, caller ID, conferencing (including videoconferencing), and call forwarding--and it also supports unlimited long-distance calling, since the traffic goes out over the Internet. The phone system becomes a service that your IT department handles, which reduces costs and downtime (since you don't have to wait for a telco truck to show up if the service does happen to go down). A VoIP service breaks each employee's voice stream into packets, compresses them, and sends them over the Internet to their destination. The VoIP service then uncompresses them, puts them back into order, and reconverts them into voice for the other party to hear. This process is completely different from establishing a persistent connection between two parties, as happens with a normal phone conversation. Since the speed of your connection affects the quality of your calls, you need to make sure that you have enough bandwidth. Fortunately, the big VoIP providers are straightforward about letting you know how much bandwidth you'll need to maximize call quality and minimize wasted time and broadband space. Three of the larger players among VoIP services are Skype, Verizon Business Services, and Vonage. Skype offers first-rate VoIP services to small and large businesses in addition to VoIP services for private users. Verizon Business Services offers a wide array of VoIP services for businesses, at competitive prices. And Vonage is a major presence as a VoIP provider for small and medium businesses. 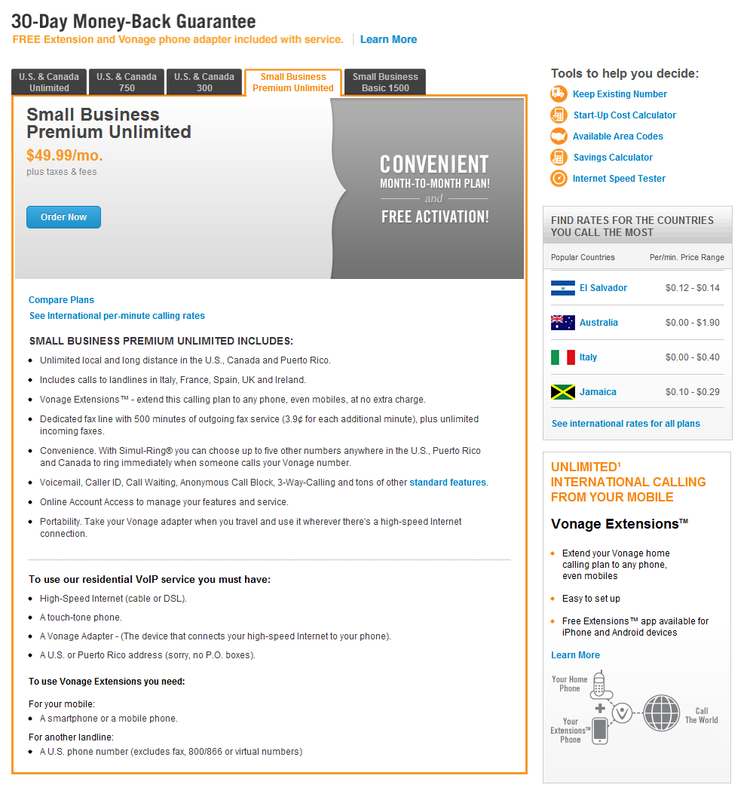 One of Vonage's service options, Small Business Premium Unlimited ($50 per month), includes unlimited local and long-distance calls within the United States, Canada, and Puerto Rico, along with land lines in many European countries. It also supports having your Vonage number to ring up to five existing lines; and among its other features are voicemail, Caller ID, a dedicated fax, and 500 minutes of outgoing calls. On top of that, you can take your Vonage adapter with you and be connected from anyplace that has an Internet connection, just as if you were in your office. VoIP providers like Vonage provide telephony services that are priced to compete with the big telco providers. If you don't want to take your Vonage device with you, you can extend the plan to any mobile phone line you specify. An app for Android and Apple devices offers even more features. Accompanying Vonage's SBPU plan is the Vonage Phone Adapter, which allows you to use existing telephones through the Vonage VoIP system. Actual Vonage phones cost from $15 to more than $100; and in my hands-on testing, the service was well worth the price of admission. Affordable as Vonage's service is, it is by no means the cheapest one available. Local VoIP suppliers sometimes beat the prices of the big guys, so take time to shop around in your area.